Vines are useful in the landscape as groundcovers, as a covering for a fence or blank wall, or as shading on an arbor or trellis to cool a patio or deck. Just remember that they can be very vigorous and sprawl over, twine around, climb up, or attach to whatever gets in their way. As long as you keep them within bounds and under control, they can be effective. Like other plant groups (trees, shrubs, and so on), vines offer a variety of ornamental characteristics, including seasonal flower color, bright berries, and autumn color. Because most grow vertically, you can use them in tight spots where few other plants would fit. And they are versatile — they can create privacy, provide shade, and conceal unattractive landscape features. 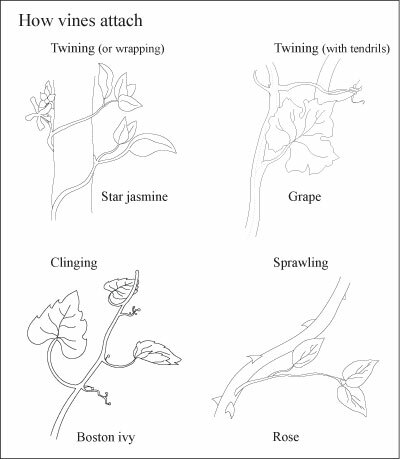 Vines are grouped into several types, according to the way they climb, as shown in Figure 1. Vines need to grow on something, either another plant or a trellis you provide. Before deciding what kind of support to provide for your favorite climbers, you need to know exactly how the vines attach themselves. Figure 1: A look at the different ways vines attach. Clinging vines. Examples are English ivy and Boston ivy. These vines have specialized growths — like little suction cups or claws — along their stems that can hook onto any surface they touch. Sprawling vines. An example is a climbing rose. These vines are often vigorous, spreading plants. In order for them to climb, they need to be tied to a trellis or support. Twining vines. These vines come in two types. Some, like star jasmine (Trachelospermum jasminoides), wrap around anything that falls in their way. Others, like grapes, have small, twining tendrils at the bases of their leaves. The tendrils grab and wrap around anything they can reach. Should vines grow on walls or fences? Clinging vines, such as English ivy and Virginia creeper, can attach so firmly to walls and fences that getting them off without damaging the structure becomes almost impossible. And sometimes the attaching parts of the plant work their way into cracks and crevices. As they enlarge and grow, they can lift shingles and damage even the sturdiest materials, such as concrete and brick. Letting a clinging vine attach directly to the walls of your house usually isn’t a good idea, unless the house is made of brick, stone, or aluminum siding. And even then you can have problems. Instead, build a trellis a few feet away from the side of the house and let it support the vine. That way, you can also paint the wall (behind the trellis) if you need to. As vines grow, the branches enlarge and the plant gets heavier. If the supports aren’t strong enough, they can buckle under the weight. Build supports that are sturdy and long lasting. Two-inch galvanized pipe and pressure-treated 4×4 lumber are both good choices. You have many ways to support a vine, from arbors to lath trellises to wires strung between secure anchors. The important thing is to plan the supporting device in advance, make it strong, and design it to fit the growth habit of the vine. Probably the simplest way to support a vine is to let it climb up and ramble through a companion tree or shrub — the way many vines grow in nature. This display can be enchanting in a landscape if the two plants are good companions. Moderate growers, like clematis, happily associate with large shrubs. Vigorous growers, such as ivy, are best kept out of trees. Don’t let any type of vine climb into the tops of trees. Vigorous vines usually compromise the health of the tree. Heavy fences or the walls of outbuildings are another place to plant climbers, and these supports require little work from you. A chain-link fence can be transformed from an eyesore to a wall of color with a handsome climbing rose or Virginia creeper. In winter, the leaves drop from deciduous plants, but the eyesore will still look better than without the vine. The classic structure for any vine is an arbor. The simplest of these may be a pair of posts with a timber or arch spanning the top. You train the vine to grow up the posts and over the arch. You can use a series of these arches to make a shady outdoor tunnel or to cover an entire patio. Attach wire to the posts to help the young vine find its way to the top. Pruning prevents vines from getting out of control, becoming too heavy, or growing into places that you don’t want them. Prune heavily to keep the vine healthy and attractive. Winter is a traditional time for pruning, but you can prune in any season to keep a rampant vine in check. Prune flowering vines like wisteria immediately after the plants drop their blooms. The best time to do your major pruning of vigorous-growing fruiting plants, such as grapes and kiwi, is during their dormant season (winter). You can choose from dozens of vines to adorn the sides of buildings or fences as well as ramble through your shrubs and trees. If your space is limited, look for kinds that offer something interesting during more than one season — for example, beautiful flowers in spring and handsome foliage in summer. Some vines provide handsome bark on artistically twisting branches in winter, and others offer superb autumn color. Plant encyclopedias are a good place to start digging deeper into the world of vines. You can also find a good selection of vines at botanical gardens and quality nurseries.